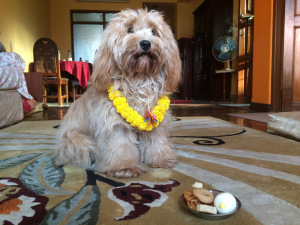 All dogs are honored with treats and decorations during an October festival in Nepal. This one belongs to Amish’s uncle. Imagine a holiday for celebrating dogs. Not just pampered pets, but strays too. All over the city and countryside, people shower puppies and older dogs with treats, blessings, and decorations. This festival is real, but few Americans are aware of its beauty or significance. When my Nepali son-in-law, Amish Karanjit, told me a story from his own childhood, I was awestruck. He captured my imagination. I asked him to tell it again, this time while we were enjoying a meal of curries and momo (dumplings) at a Nepali restaurant. Our dinner companions were the noted poetry wizards Janet Wong and Sylvia Vardell. From the delighted expressions on the faces of these literacy experts, I could tell that Amish’s story belonged in a children’s book. ← by lthang2308 on Flickr.Tam Coc – Bich Dong is a popular tourist destination near the city of Ninh Binh in northern Vietnam.